Joan Bailey explains how permaculture and its design framework has helped Sunrise Farm and their community become more resilient since the 2015 earthquakes. It’s hard to believe I’m in Kathmandu for many reasons, not the least of which is the place where I find myself: Sunrise Farm. I’m weeding on the second of four terraces of their forest garden that runs up the hill to an elementary school. Overhead the trees – palmello, pear, apple, Nepali plum, avocado, mikan and mulberry – stretch grey trunks up to new leaves that will eventually shade the ground below from the monsoons and blistering heat to come. Many are heavy with flowers or the first tiny fruit, all pollinated by the birds and insects that flutter and buzz above. The trees are planted along the ridges between the terraces and the swales that divide them into fields, and under my hands is more life: worms, spiders, and other insects. I hear neighbors laugh and chatter, the sound of horns from the street, and the early evening air begins to fill with smoke from countless cook fires. Created nearly 30 years ago by Shyam Shrestha, Sunrise Farm is one of Nepal’s prime permaculture institutions. Part of the Himalayan Permaculture Center, regular workshops and events annually draw more than 500 volunteers and students from all over Nepal and the world. Set behind the Shrestha’s three-story brick house and off from a busy, dusty road, it is a place of peace and quiet where the family of five also live. Shyam, retired now, guides his oldest daughter, Prabhina and his son, Soroj, in daily management of the farm and continues to experiment with new techniques and methods. His wife, Sanu, takes care of the cow, runs the household, and also helps on the farm while his youngest daughter, Sabhina, works in the city. On April 25th and May 12th, 2015, the permaculture practices at Sunrise Farm underwent an unexpected test. Two earthquakes – 7.8 and 7.3, respectively – shook the Kathmandu Valley. Over 8,000 people were killed and more than 21,000 were left homeless. Kathmandu and much of the eastern part of the country suffered severe damage to infrastructure and cultural institutions. Entire villages were flattened or buried by avalanches. “It was like a bomb went off,” says Prabhina as she describes the first few seconds of that April afternoon. “You could hear houses crumble and see the dust. We got everyone out, including the cow, just in time.” Moments later, they watched helplessly as the cowshed crumbled. Prabhina shows me where the wheat and rice fields used to be. “Our neighbor’s house fell on it,” she says matter-of-factly, pointing to a pile of rubble. Like the rest of Nepal, much has been done at Sunrise Farm, but there is still a long way to go. Permaculture though, Prabhina states, gave her family a number of advantages. The earthquake revealed a resiliency that surprised even Sunrise Farm. “Our neighbors came here to ask for firewood, to seek shelter in the open space of our fields, and to find food. Our fields provided plenty, and we shared whatever we could,” Prabhina tells me, including milk from the cow, a valuable source of nutrition that is an integral element in Nepali religious and culinary traditions. Permaculture also linked Sunrise Farm to a global network that reached out to the family immediately after the disaster and that has been in touch ever since. People send seeds, messages of support, or come and help repair buildings or rebuild fields. For the Shrestha’s, this support, both in its emotional as well as its physical and financial forms, is invaluable. “Permaculture,” Upreti continues, “offers a holistic approach that reflects people, their soil, and their traditional practices. Everything differs from plain to hill to mountain,” he says pointing to a map of Nepal on his office wall. Wedged between India and China, Nepal is home to 26 ethnic groups, 7 religions, and 13 languages, with inhabited areas ranging between 59 and 4,360 meters above sea level. Finding something to encompass all of this and disaster recovery is akin to a miracle. Zachary Barton, founding member of the Kamala Foundation and permaculture practitioner, also believes permaculture’s holistic approach is key for Nepal’s disaster recovery. He and Prabhina collaborate on a two-year program called Recovery through Resilience. Designed by Chris Evans, a British permaculturalist who helped found the Himalayan Permaculture Center and has worked with Nepali farmers since 1985, the program uses permaculture design principles to help communities rebuild while simultaneously addressing income, health, and environmental issues linked to a lack of sustainable agricultural practices. All of these problems existed before, Barton says, but the earthquake and a recent five month long blockade at the Indian border brought them into stark relief. Prior to the earthquake, two villages, Kule and Bhattedanda, strained to meet the daily needs of their 120 households due to environmental degradation and failed international development efforts. Both suffered severe damage and loss of life during the earthquake. Village leaders contacted Sunrise Farm in search of help. The first six months of Recovery through Resilience focus primarily on observation and building positive relations between village residents and the Barefoot Consultants, trained farmers from West Nepal who will live and work in the villages for the duration of the program. Based on the information gathered, Zachary designs community-specific plans that Prabhina then coordinates with the consultants and residents. During the second six months the Barefoot Consultants will offer more specific training on organic farming, women’s health, youth entrepreneurship, and post-harvest production. In a country where 80-percent of the population is engaged in agriculture, going forward in a sustainable way is pivotal, says Barton. Everything aims to build the capacity and resilience of the village in a way that is tailored to their location, interests, and needs. By the end of the two years and as word spreads to the surrounding areas, Zachary and Prabhina estimate that more than 1,000 people will have been helped. “This program helps better the community. They become more self-sustainable and work together to develop their abilities to reconstruct themselves. It’s permaculture in action,” says Barton. This project is supported by Lush and the Kamala Foundation. 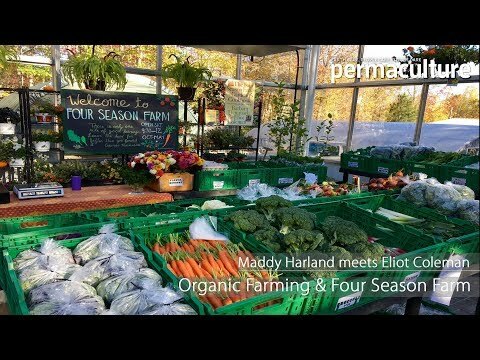 Is The Future of Sustainable, Healthy Food Just Organic?